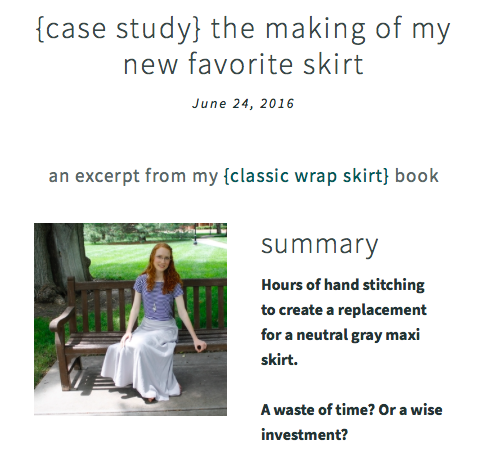 Writing a case study on a personal project doesn’t have to be hard! Case studies are write-ups of past work that show potential clients your process so they know what it would be like to work with you. Effective case studies make great clients want to hire you. Even if you have never had a client before you can write a case study that will attract great clients. If you want to make a living from pursuing a creative passion you can leverage the power of case studies by writing about personal projects. If you haven’t done any personal projects then you have a bigger problem: you like the idea of this creative endeavor but you haven’t actually done it enough to know if you have what it takes to pursue it professionally. In this case stop reading now and go create! Bookmark this article and come back to it once you have a project to write about. The secret is to remember that you were your own client. Pick a favorite personal project — one that is the kind of work you’d like to do more of (and get paid for). Approach writing about it just like you would any other professional project. While working on this project you wore two hats: the client hat and the professional hat. You only ever wore one hat at a time. You wore your client hat when you decided the project was something you wanted do. You had a problem you wanted to solve and you set a goal, consciously or unconsciously. It’s important to differentiate between the times you wore one hat or the other to clarify your process. This will help you to understand your process well enough to explain it to potential clients. When a potential client understands your process he will be able to see himself working with you. As you write, focus on the goal and how you accomplished it. Tell the story of how you successfully accomplished what you set out to do. Early on in the case study clearly explain the problem you set out to solve and articulate the end goal that you had in mind. As you tell the story of your project keep this goal in mind. Share details that support the story of successfully accomplishing your goal. Explain why you made the decisions you did and explain it in the context of accomplishing the goal. In the hand-sewn skirt example, a detail like the durability of the fabric is important because the purpose of this project was to create a go-to skirt that would be worn frequently. Keep your potential client in mind. Write to one specific person: your ideal client. Keep the details relevant to his needs and wants. You are writing this case study to get great clients, not impress your peers. An example of an irrelevant detail from the skirt case study would be the store the fabric came from. This is the kind of detail that a fellow seamstress would find interesting, but a client would not.